P C Mahalanobis or Prasanta Chandra Mahalanobis was an Indian scientist and statistician. He is well known for the Mahalanobis distance, a statistical measure formulated by him. 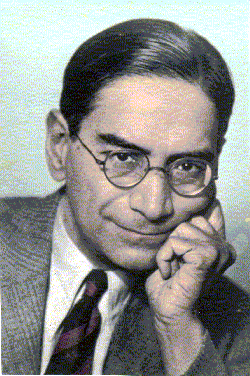 PC Mahalanobis was born on June 29, 1893 in Calcutta. He was born in a family of intellectuals. His father Prabodh Chandra Mahalanobis was a professor of Presidency College. His mother was Nirodbasini. His grandfather Gurucharan was an active social reformer. Gurucharan was actively involved with Brahmo Samaj. PC Mahalanobis completed his schooling from Brahmo Boys School and joined Presidency College. He completed his Bachelors of Science degree in Physics in 1912. Later in 1913, he joined the Kings College of University of Cambridge. During his stay in England, he developed a great interest in Statistics. He found that the statistics can be applied in the problems of meteorology and anthropology. After completing his education, he worked with C. T. R. Wilson at the Cavendish Laboratory and later as a professor of physics in Presidency University. In Presidency, he started a group for the people interested in statistics. Later this group started to grow and eventually turned into Indian Statistical Institute. ISI was registered in 1932. In 1933, they started the journal Sankhya. Under his leadership ISI grew to a great extent. In 1959, ISI was declared as an institute of national importance and a deemed university. His major contribution to statistics was Mahalanobis distance. Which he discovered during the studies of anthropometric measurements of Anglo-Indians in Calcutta. He was the pioneer of pilot surveys. His contribution in large scale survey is immense. Between 1937 to 1944, he conducted many large scale surveys. After the independence of India, he established the Central Statistical Organization to coordinate statistical activities in India. He was also the member of second planning commission which helped in rapid industrialization of India. He was honored with many prestigious awards- Padma Vibhushan (1968); Weldon Memorial Prize from the University of Oxford (1944); Fellow of the Royal Society, London (1945). In 2006, Indian Government declared the 29th June as National Statistical Day to celebrate the birthday of P C Mahalanobis. On 28 June 1972, he took his last breath.